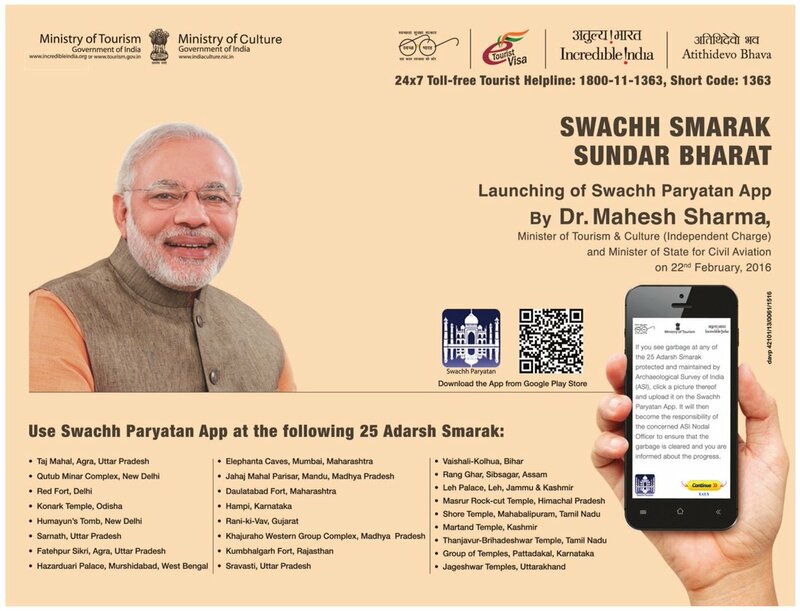 “Swachh Parayatan Mobile App” was launched by Dr. Mahesh Sharma, the Minister of State (I/C) for Tourism & Culture and Minister of State for Civil Aviation at a function. This project is being implemented by the Ministry of Tourism, Government of India through DeGS and NIC. This Mobile App is available on Google Search Engine as ‘Swachh Paryatan’ and initially it is available on Android Phones and very soon it will be available on Apple and Microsoft also. This mobile app shall be monitored by the Project Monitoring Unit of Swachh Bharat Mission in Ministry of Tourism. Addressing on the occasion, Dr. Sharma said that since the general public and the tourists are the largest stakeholders in keeping the monuments clean, the Ministry of Tourism has decided to facilitate the general public to communicate their complaints about any unclean area/garbage piles in and around tourist destinations. Hence as a part thereof, the Ministry of Tourism is launching this Mobile App. He opined that till all stakeholders don’t contribute, such project will not succeed. The Minister informed that the recently launched Tourist Infoline is getting 18000 responses daily and is very successful. He dwelt upon many initiatives launched by his Ministry for the benefits of Tourists. He said that the Domestic Tourism has also immense opportunities like International Tourism. That is why the suggestions from public and tourists are solicited on this Mobile App. Shri Vinod Zutshi, Secretary, M/o Tourism in his address said that year 2016 has begun with good news in Tourism sector. A Mega Tourism Summit is expected in July-August this year which will boost the Tourism Sector. He said that M/o Tourism and M/o Culture will work together to make this Mobile App a successful one. To start with, 25 Adarsh Smarak Monuments protected by Archaeological Survey of India (ASI) have been identified for inclusion in the app. The application would be scaled up to include more monuments as the campaign expands. This mobile app enables a citizen to take photograph of garbage at the monument and upload the same along with his/her remarks. The application then sends an SMS to the ASI Nodal Officer concerned with the monument upon receipt of which the Nodal Officer gets the garbage cleared/removed. The Nodal Officer thereafter sends confirmation about the redressal of the complaint through an SMS to the complainant.